We have made it much easier for you to have your own custom, top-level domain. Choose from any of these domain extensions: .com, .net, .org, .club, or .biz. We have also added the option to purchase Country code top-level domains: .ca, .com.br, .co.uk, .com.mx, .co, .de, .co.za, .it, .eu, .in, .us, .nl, .es, and .dk. Our hosting packages can be purchased on a monthly or annual basis. Take a look at our Pricing page to choose the package that best fits your needs. One of the benefits of having a custom domain is that it is shorter, easier to remember and appears more professional. So, this is a very worthwhile investment for your site. When you buy a domain through us, we take care of setting everything up for you and once your domain is up and running, you will be able to update your site at any time with a single click! If your site is already published to a Yola subdomain, it will automatically redirect to your new website address, for example, www.yourdomain.com. This means that you won't lose the value of any links or visitors who only know your old location, as they will be directed to your new custom domain. 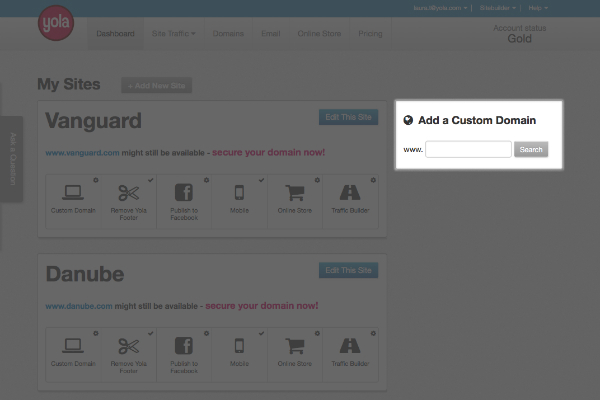 To publish your site to your custom domain, click Publish. A dialog box will open up with the available publishing options. In the first section, "Search for a custom domain", you can search for and buy the domain of your choice. Enter your desired domain name in the box provided to confirm its availability. Once you have chosen your domain name and it is available to purchase, click Next. 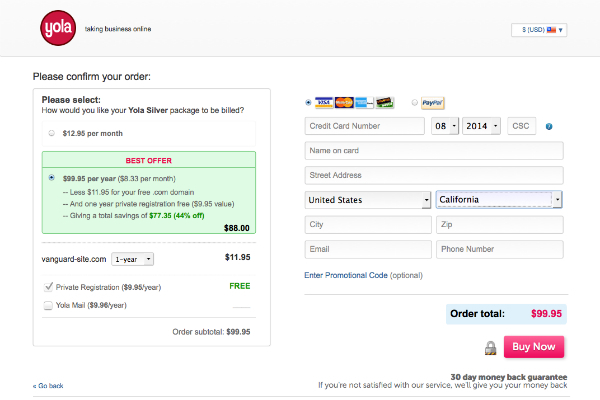 On the following screen, select the package you would like to purchase, either Yola Bronze, Yola Silver or Yola Gold. Select the subscription plan that will suit you, either monthly or annually. If you would like a customize your email address, for example, name@example.com, check the "Mail" box to purchase Yola Mail for an additional $9.96 per year (Yola Mail is not available to partner programs). If you want to have domain privacy enabled, check the "Private Registration" option. Select the payment method, either a credit card (Visa, Mastercard, American Express or Discovery) or PayPal. Enter your billing and credit card information in the form provided. Click Buy Now to complete the payment process. You will receive a receipt via email to indicate that you have purchased the domain and hosting package. Your site will be up and running on your new domain within a few hours. You can upgrade to a custom domain in My Yola. Log in and, under "Add a custom domain name", enter in the desired domain name. This will take you through the same process described above. Your domain name and hosting package can be purchased separately, provided that you first purchased a hosting subscription. However, if you purchase a custom domain first, you will be prompted to buy a hosting subscription at the same time. There is no limit to how many domains you can purchase per hosting package. Buying a domain does not guarantee that your site will come up in a Google search right away. You will still need to promote your site, there is more info on this tutorial: Introduction to SEO. Any domain name you purchase through us remains your property and if you ever need to transfer it, this can be done. More info available on this link: Managing the domain you bought from Yola. If your site is already published to a free Yola subdomain, you will be given the option to upgrade to a custom domain whenever you update your site. Can I get an email address with my domain? Of course! This tutorial will get you started: Creating an email with your domain. 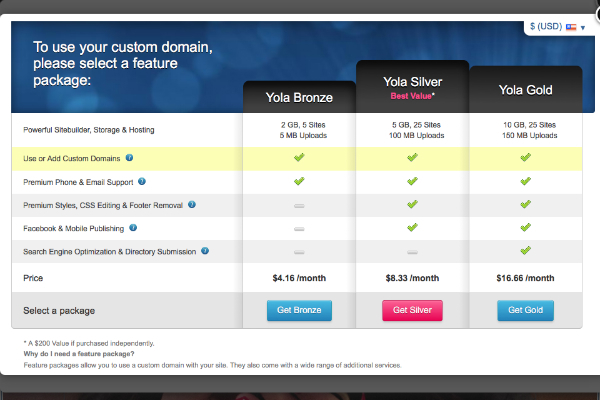 What additional features do I get if I buy a domain from Yola? When you purchase a domain from Yola, you have the choice of three hosting packages, available on a monthly or annual basis. For more information about the hosting packages, click here: Yola Bronze, Yola Silver, and Yola Gold. I bought my domain, but I want a different one - can I change it? Go to Settings > Publishing. A dialog box will open up asking to confirm if you want to unpublish. Type "Unpublish" into the text box provided and click Unpublish site. Your site is now unpublished. Click Publish Site and click the Search for a custom domain button and follow the same steps described above until your site is published to your new domain. Your original domain still belongs to you and you will receive renewal notifications about this domain about three months prior to the date it will be renewed. I bought a domain from another registrar. Can I use it on Yola? Definitely! 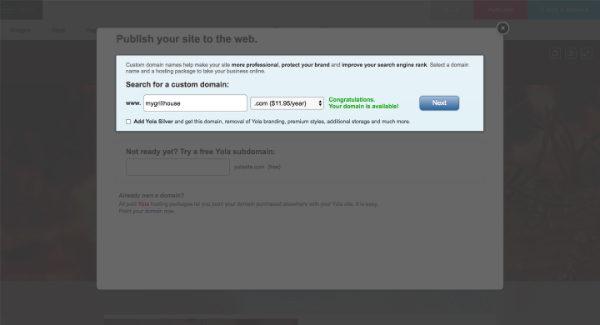 If you've purchased your domain from another registrar, you'll need to configure it so that it points to Yola. Steps are available on this link: Publish to a domain you already own. This is available to Yola Bronze, Yola Silver and Yola Gold, as well as partner programs. Is it safe to give my credit card details out so that I can buy a domain from Yola? Absolutely! We use all the standard security features that you would see on any site that accepts payments. We're serious about your security online, and we’ve integrated with Verifi payment gateway to ensure that your credit card details are stored in a highly secure Payment Vault that is fully compliant with the Payment Card Industry’s Data Security Standard. Read more about it here. During purchase, you can select whether to pay for your hosting on a monthly or annual basis and will also be taken through the steps to set up a stored payment method for rebilling. I bought the domain from Yola, but I would like to enable domain privacy. Is it too late? Not at all! Please note that if you have purchased both a domain and one of our annual hosting packages, you will receive one year of free domain privacy. If you have opted for a monthly subscription plan, you can send us an email, we'll be able to arrange it for you for a fee of $9.95 USD. How will I know when to renew my domain registration? When you purchase a domain, you are opted-in to auto-renewal. Take a look at this tutorial for more information about the benefits of auto-renewal: What are the benefits of auto-renewal?. If you no longer wish to keep your domain, please contact us up to one month before your domain expires for further information. Can I renew the domain before renewal time is due? If you would like to renew your domain purchase for a further year or longer, you can do so by following the steps on this link: Renew the domain you purchased from Yola.